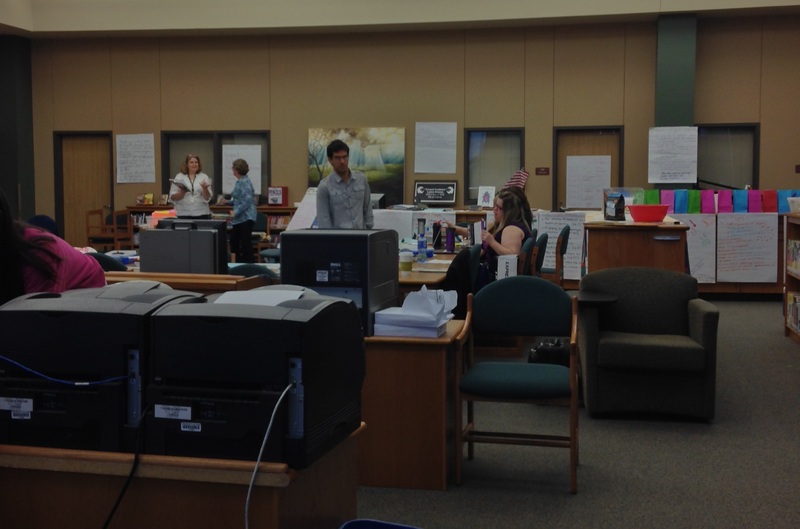 This past summer, 2014, NSTWP had the opportunity to work with 15 teachers from around the metroplex. These teachers filled out an application and went through an interview process to be chosen to participate in the summer offering. Summer Institute 2014 was held at Guyer High School from June 9th through July 3rd. 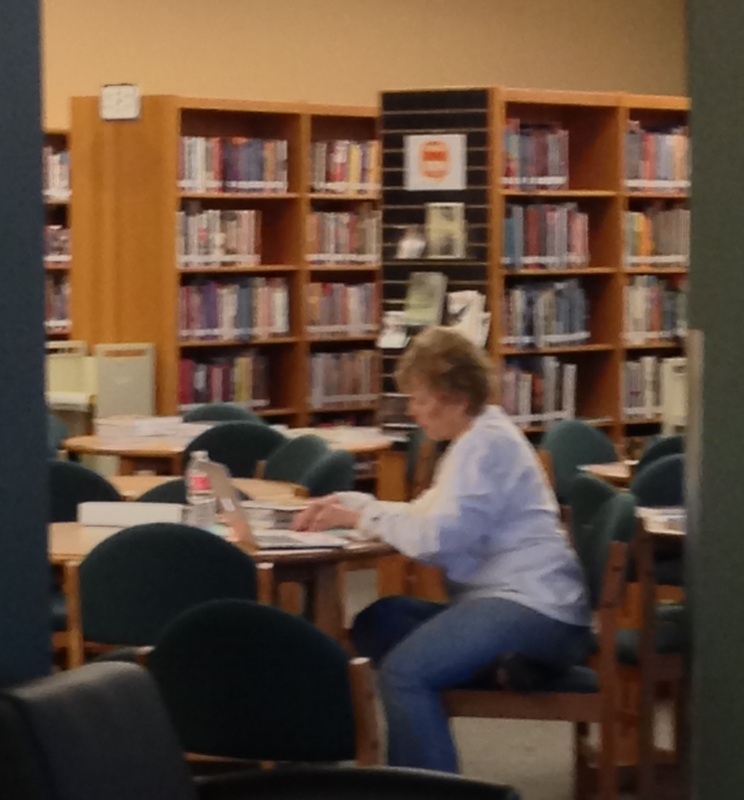 The group also met for two Saturdays in the spring to prepare for the summer coursework. 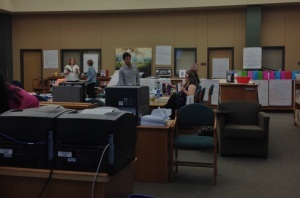 We also had the opportunity to meet each afternoon with a Writing Workshop class being offered through UNT. 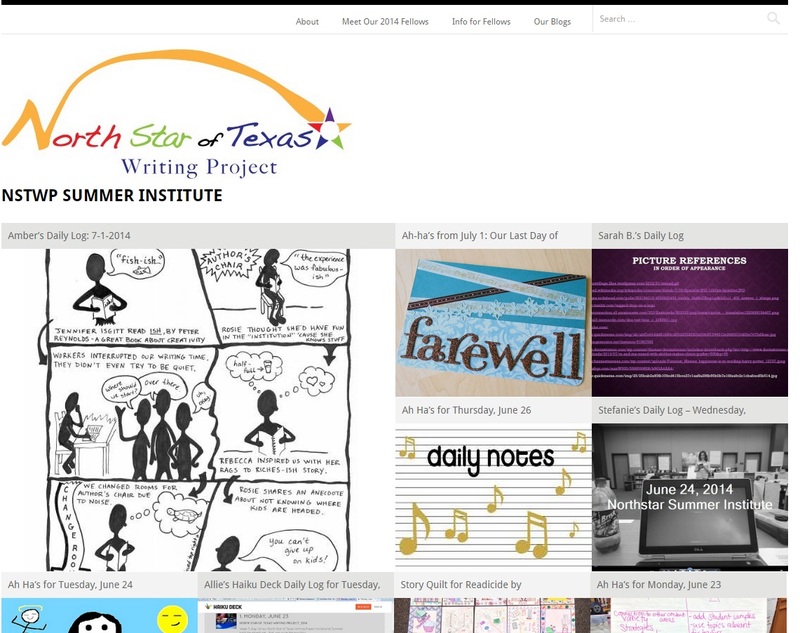 This summer, the teachers created a website, blogged, presented teacher demonstrations for each other, and generally had a great time. Check out their website! What did summer institute participants have to say about what was the most important thing they learned from their experience? 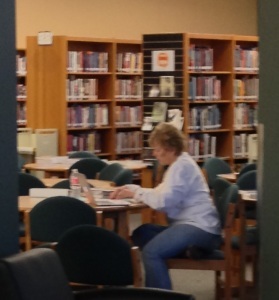 Dr. Wickstrom is a dynamic and perceptive instructor. 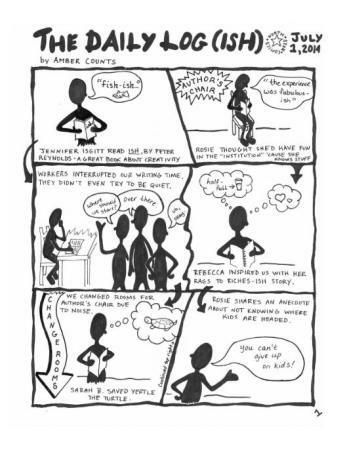 I think that her model will help me greatly in my own teacher leader position. I learned how to become confident in my writing an how to use that to influence my students. 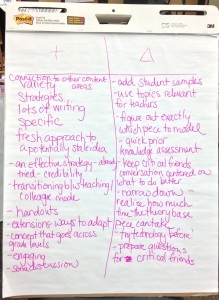 I also learned a tremendous amount about how to integrate writing across the content areas. 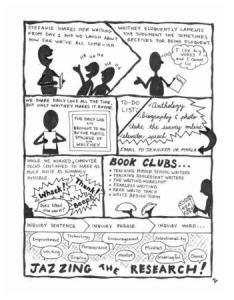 I think I going through the writer’s workshop experience as a student allowed me to see what it feels like for my students. As a result, I can understand their feelings and needs as emerging writers and plan to implement these structures (inspirational reading, free writing, author’s chair, working through pieces, conferences and daily feedback), with the knowledge of how kids think and feel in this process. Learning that people are not born writers. It takes a lot of hard work and consistency to become a good writer. I gained two important things: I understand more how writing is a tool for thinking and can be integrated into reading instruction to improve both reading and writing achievement. I also learned the power of drafting in my own writing, something that I know will help me as I continue my studies. 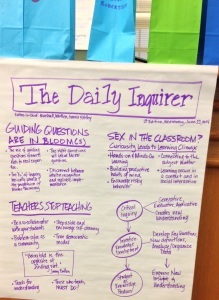 The inquiry paper helped shaped my writing instruction for my own classroom. 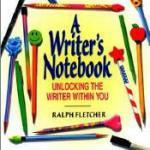 I was able to get a variety of useful teaching methods and understanding about writing. Confidence to teach my future students the way that will most benefit them in life as well as on standardized tests. 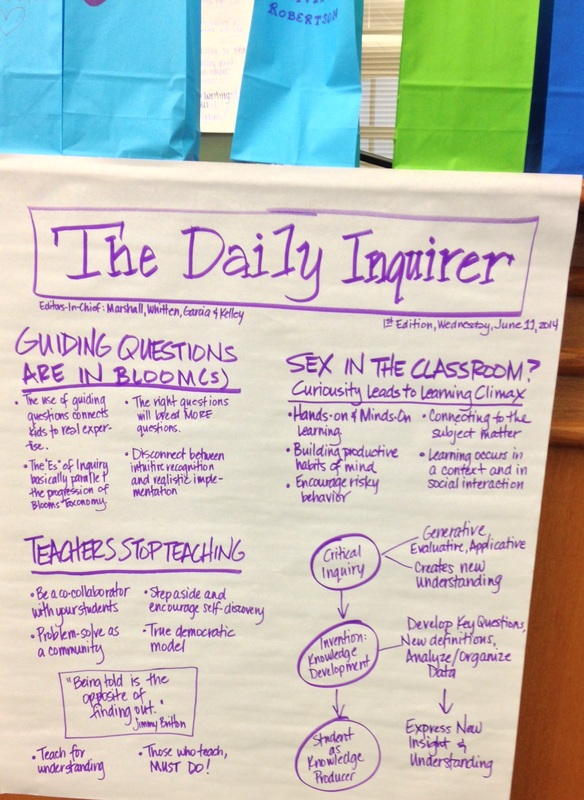 I gained a better understanding of the writing workshop and inquiry model. Furthermore, the review of the literature on reading and writing was helpful in refreshing my understanding and jumping into the educational rhetoric on the issues. I have a master’s degree in teaching composition at the university level but have been teaching high school for most of my career. This class enhanced my composition foundation by providing more tools to foster a love of writing in the classroom, not just the basics of teaching composition. 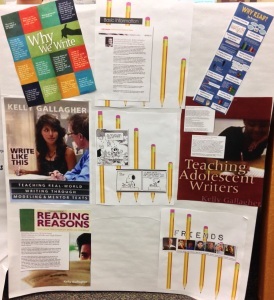 The most important thing I learned in the summer institute was how to fit writing workshop into my schedule. 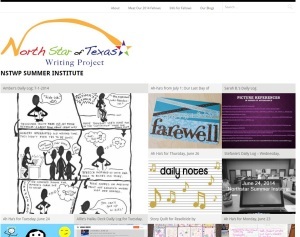 Before the summer institute, I was aware of writing workshop and its value in the classroom, but I was not sure how to integrate it into my classroom. Now I feel more confident in integrating it into my classroom schedule, as well as modifying it based on my students’ needs and ability levels. The most important thing that I gained is that I can better advocate for teaching writing and reading over all the core content areas. I have more research to back my ideas, and research that I know our administrators have currently read, to incorporate and better help with professional development days. 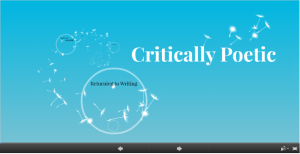 Confidence in my writing and ability to teach writing. I had to relearn writing and I remembered what it felt like to be a student and be writing daily. I gained a lot of helpful and practical tools that I can use in my classroom day 1 of next year. 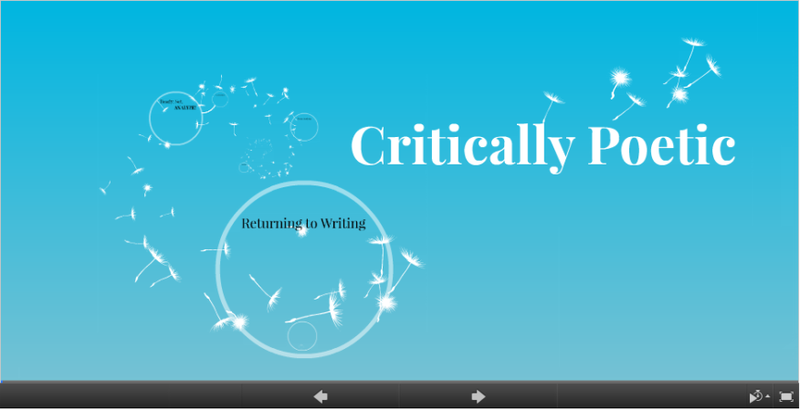 I also gained an excitement for writing that I am hoping to pass on to my students. Following are some of the highlights from our activities this summer. We hope to offer a Summer Institute in 2015. Keep watching the website for more information. 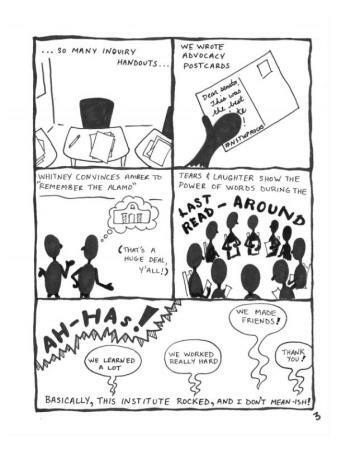 An example of a Daily Log – This is page 1. This is page 3. Thanks Amber Counts! Here is another Daily Log. Thanks Jenny Smalley! One of many “Writing Guru” student-created charts – This one is about Kelly Gallagher. 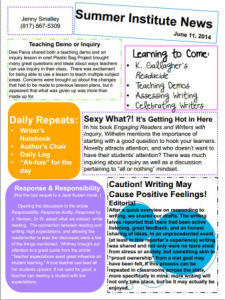 Another example of a “Writing Guru” chart. 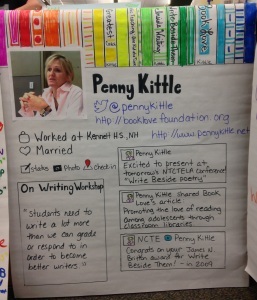 We blogged six times during our Summer Institute. We had time daily to work on our writing. 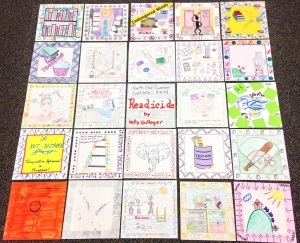 We worked together on our Inquiry Projects as well as in a Book Club. 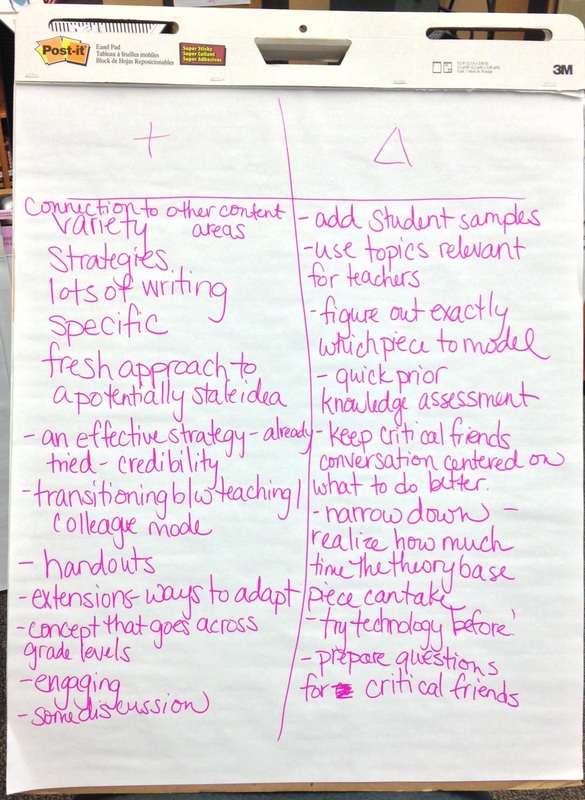 The teachers modeled many types of strategies we could take back to our classrooms. We each did a Teaching Demonstration for our fellow students. 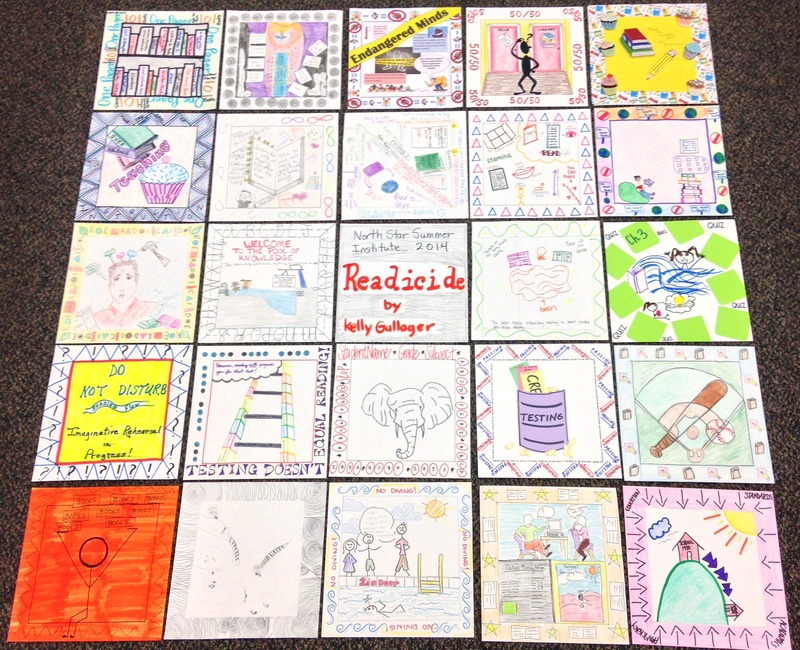 This Story Quilt was created by us as we were reading and discussing the book Readicide by Kelly Gallagher. Some of us took a Friday to attend the North Texas Council of Teachers of English Language Arts conference held in Hurst. 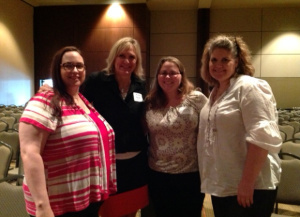 We got to meet some of our writing gurus in person. 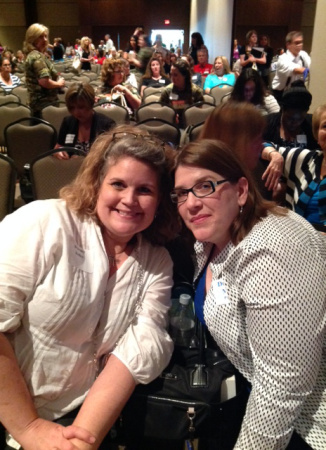 This is Whitney Kelley with Donalyn Miller, author of Reading in the Wild and The Book Whisperer. 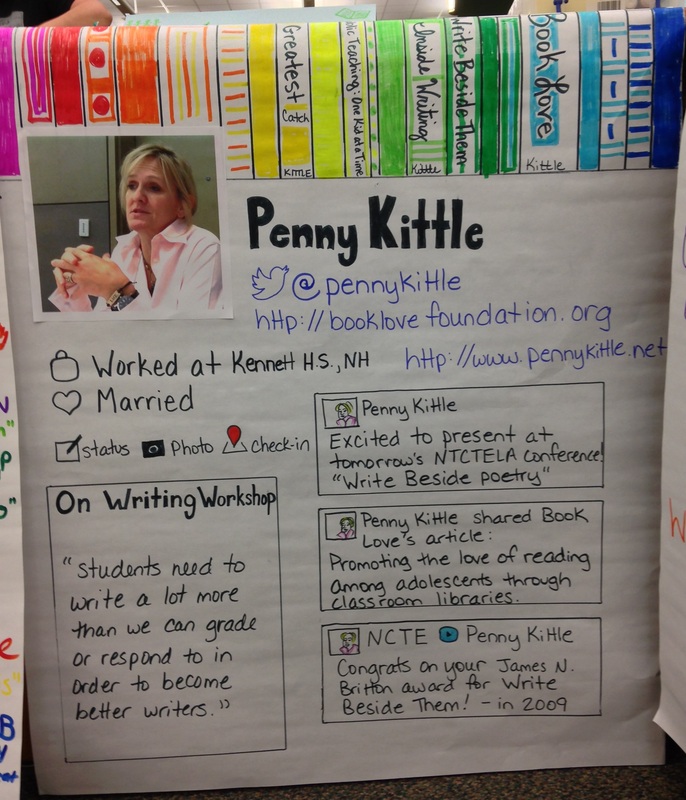 Some of us also listened to a presentation by Penny Kittle, author of Book Love. This is Amber Counts and Whitney Kelley, new NSTWP TC’s with a teacher colleague. 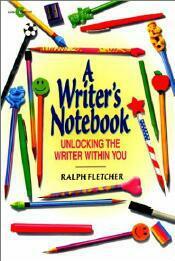 We had a short read-aloud daily from many mentor texts, one of which was this one by writing guru, Ralph Fletcher.